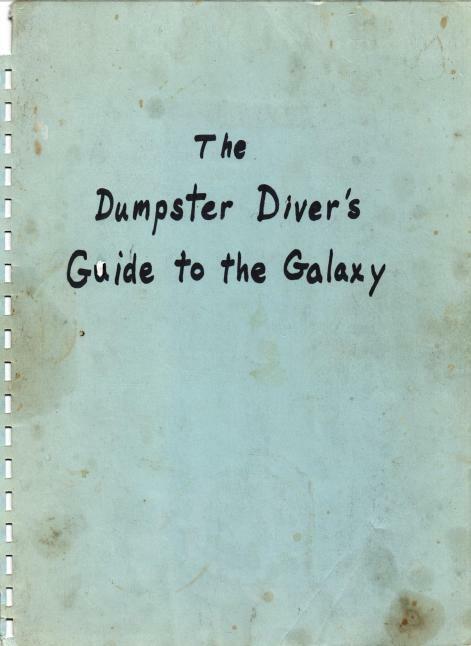 The Dumpster Diver's Guide to the Galaxy. What you have here is a gathering of thoughts on Dumpster diving, pulled together by me in my very early days on that new (to the masses) gizmo called the internet, ca. 1998. If you ask why, I will say, "Because I come from a long line of Dumpster divers." After working in carpentry and general home improvement, my father, a character called Ben Sauter, started raising hogs on his parent's farm in Baltimore County, Maryland. Guess where he found food for the hogs? In searching fer pig food today, I came upon a dumpster loaded with about 1000 lb. of raisins. All in 30 lb. cartons. Looks like the Bagel Shop got some worms in their raisins and had to throw them away. The odd part is that raisins are so scarce right now and are worth $2.75 a lb in the stores. We have more good candy around here. The A&P reorganized their stores and threw it away by the bushels. Even after the pigs were gone and the farm developed, the call of the dumpster was too mighty to resist. You couldn't either. Remember that this is from the pre-Google days, and from an era when, if you typed a topic of interest into a search engine, you could actually get real comments by real people speaking from real personal experience on the topic. It wasn't just a few hits on Wikipedia, Youtube, and Amazon, followed immediately thereafter by a thousand pages of complete irrelevance to what you entered. Most of the material in the book is no longer to be found on the internet. The material that does survive, I strongly suspect you could never dig down to it with a google search on "dumpster diving". Now that discussion groups have been abandoned for the drivel of social media, I wonder if something like this could be produced now. Is Facebook even searchable? If so, I doubt all the considered comments on this, or any topic, could fill a post card. So here you have an internet relic. Dive on in; it don't smell so bad, and there's tons of great, humorous and interesting stuff to find.